Supporting Points, 2015. 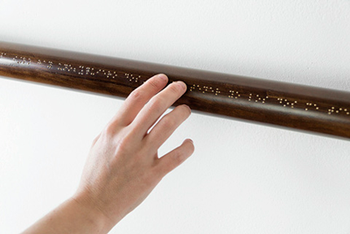 Three wooden bars with alloy braille inscription. Always in reference to the body, the exhibition contains interconnected expressions of empathy, communication and the overcoming of adversity. What it is to be with, to be without and to recognise that all require support in some measure. Escalona’s work explores the world from the perspective of a vulnerable body. A gilded wheelchair titled ‘El Carro de Apolo‘ (Apollo’s Carriage) and a limply hanging parachute titled ‘Misetatione non mercede II‘ are typical of his combination of autobiographical aspects with references varying from Greek to Catholic symbology. A socio-political dimension is also bound up in references to the Spanish Civil War and the role of religion in considerations of pain. His references to trauma confront adversity, suggesting the means to overcome it in physical terms but also psychologically by changing our perspectives. ‘In Puntos de Apoyo’ (2015), a braille inscription on a ballet barre reproduces a text by Frida Kahlo with the same title, expressing the frustration that is overcome by strength of will. Echoing the empathetic and communicative focus in these works, Oscar Santillan’s ‘Telepathy Manifesto‘ presents a looped video, mounted above the viewer, of the artist trying to catch a man’s tears in his own eyes as they fall from above. The desire to be understood takes on emotional and experimental dimensions here as if proposing some alternative means of communication for those who cannot express themselves. 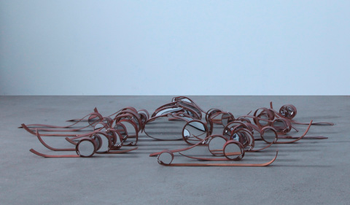 ‘Speech, speed, speechless, speeding, speedy, speedometer, speedboat, speed, skating, speed or nullum crimen, nulla poena sine praevia lege‘ (2015) by Julia Varela presents thirty-four belts around cut mirror forms that represent an anonymous body in fragments. The reflections and duplications in the work stem from Varela’s interest in the practice of hired mourners who are used in some societies to extend and amplify grief at funerals. Just as the belts literally hold the work together, the exaltation of support mechanisms recurs throughout the exhibition. Varela’s understanding of the body as a battlefield, as a space for the expression of conflicts, connects with the idea of overcoming adversity in a broader societal sense. Marco Godoy makes more direct reference to socio-political concerns, integrating the slogans of the Athens Polytechnic uprising of 1973, “Bread, Education, Freedom”, by translating them to blind-deaf tactile signing as an alternative means of communication. The touch is personal and empathetic, but incomprehensible to the uninitiated without translation. These words were reactivated, after a period in standby, to protest against the Greek ‘troika’ during the recent anti-austerity demonstrations. Detached from the traditional language of protest the significance of these words is renewed, three simple requests repeated.